We have had exactly one warm, sunny, Spring day here in Central Illinois, which was yesterday. Turns out one day is just enough time for me to clear out a flower bed, transplant some day lilies, clean out a planter, trim a couple of evergreen bushes, and get a sunburn on the back of my neck. So here's what we've got along with some of what I want to do, if you're into that sorta thing. None of my in real life friends are so I have to talk about all this to someone. Lucky you! First up, let's talk about bad first impressions. This is the flower bed in front of our home. It's so welcoming, isn't it?! 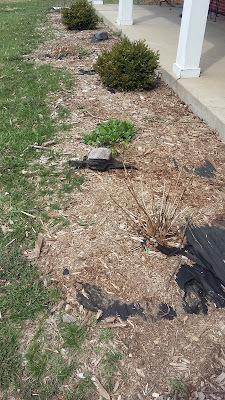 This Spring I will clean up the edge and lay down more mulch. The bare bush closest to the camera is a pretty hydrangea that I need to move to a shadier part of the yard so it can thrive. 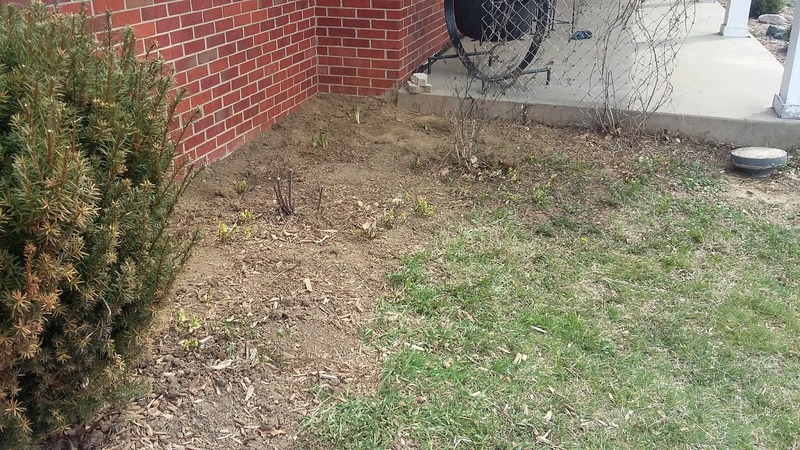 I'd like to add another butterfly bush in its place to balance the one we already have on the far end of the bed. We have some old stumps covered up with the mulch that Travis will start to work on clearing out. They go down deep but I'm hoping to get enough out so we can plant more flowers. Right now we have mums, black eyed susans, and some purple flower that I want to divide and spread throughout. I also want to add lavender and yellow yarrrow so there are repeating blocks of colors and textures throughout. I'm hoping we will find the money to buy two lavenders, one yarrow, and mulch. I'm also hoping Menard's will contact me to do sponsored posts for them. Probably neither will happen. Eventually we'd like to add a sidewalk that runs along the first half of it, curves, and leads to the front door in the center. The other half we'd like to edge with proper stone edging but none of that will happen this summer. I spent hours making this corner look this good, which seems so incredibly sad looking at the picture, doesn't it? 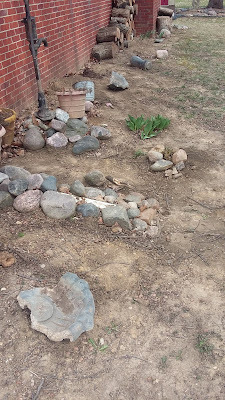 Here I trimmed back the rosebush, shaped the evergreen, cleaned out all kinds of dead, dug up crab grass and weeds, and transplanted some day lilies from another part of the yard. There is a butterfly bush in this corner and clematis grows up the chain link against the porch. I will also plant some zinnia and morning glory seeds in this area. The concrete circle is the bottom of a busted up birdbath that came with the house. I plan to dig it into the earth for a stepping stone since we always step off the porch there. A ground covering takes over this little corner so much mulch isn't needed and eventually the proper stone edging in the front of the house will wrap around to here, too. I realize that right now this looks pretty trashy. 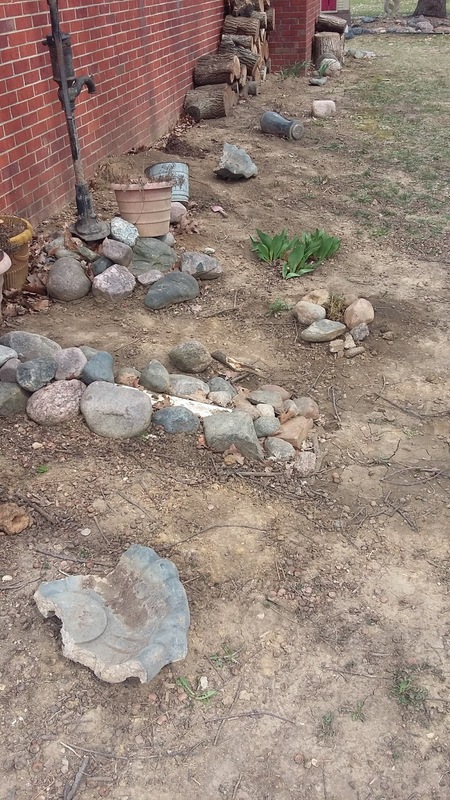 There's dirt, rocks, and bits of a broken bird bath. But I've got plans, folks. Plan #1 - wait for the hostas, bleeding heart, fern, and peonies to grow in because then it'll look really lovely, which you can see here. Plan #2 - bury half of the bath part of the bird bath in the dirt and then plant impatiens on top. Since the ground slopes away from the house this should create a bit of a berm look. Plan #3 - readjust the pump so it is flat on the ground and redistribute the rocks to other areas of the yard. Now that we've got a big 12 passenger van that won't fit in the garage I'd love to pour an extra big slab here with a sidewalk going off the end, connecting it to the patio around the back. We could store the kids' bikes and toys in the garage (right now they sit out 3/4 of the year, even in the rain which I hate) and we'd park the mondo van here, though all the lovely shade plants and landscaping would stay. I think there's just enough room for it to fit! But, of course, that much concrete costs a lot of money, even if Travis is doing the work, so that also gets moved to the three to five year plan. Really our patio is pretty nice but there is a flower bed where the play house and bird bath sit which needs more flowers. We'll see what survived the winter and I think I'll put some cosmos in. Travis has a nice grill tucked back here and we bought a nice, on sale fire pit with gift money that sits by the two chairs. There's plenty of room for the kids to play but we really need to replace the chair cushions. 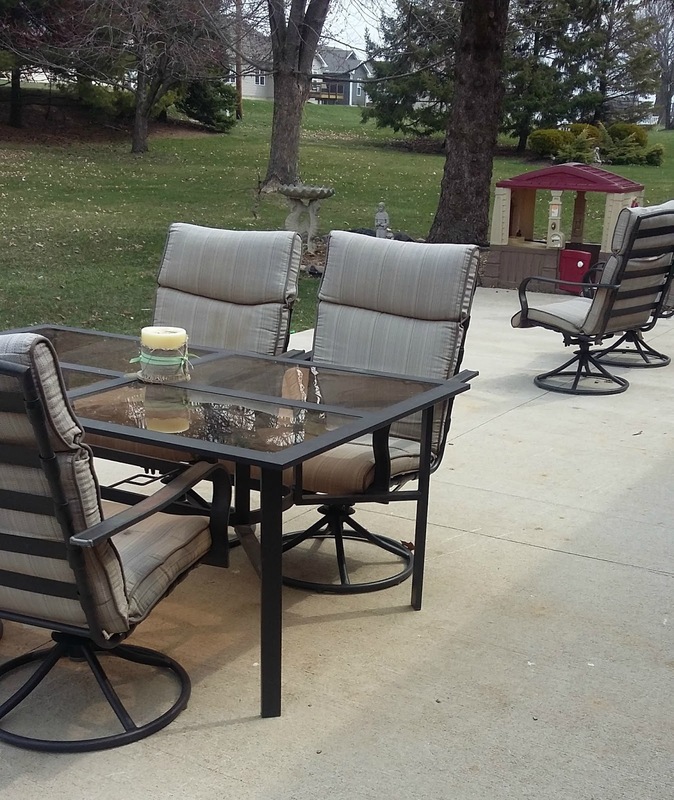 The table and chair set was a hand-me-down - which I am not poo-pooing at all, I am so grateful to have them! 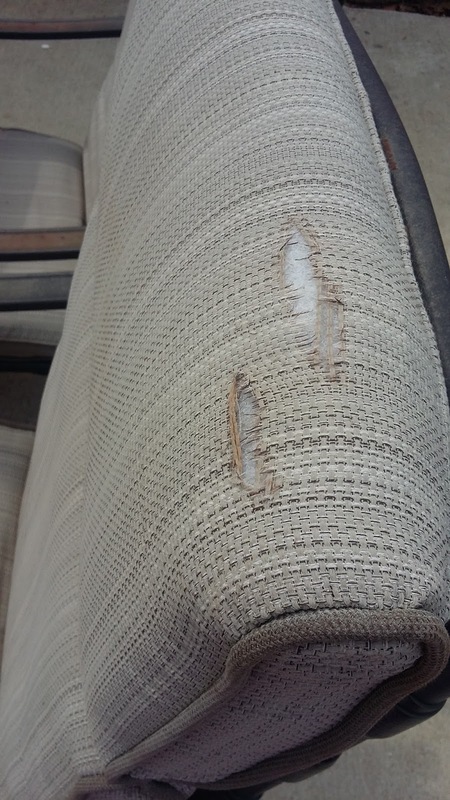 - but the cushions are in rough shape. 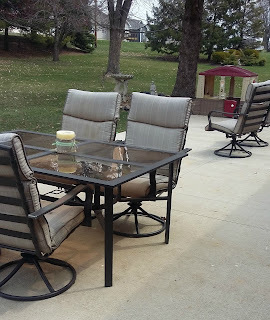 We need to sand some rusty spots and repaint the chairs (which I plan to do this summer) and then I would looooooove to purchase these replacement cushions (affiliate link) because oh my goodness they are SO STINKIN CUTE! But the almost $300 price tag for the six we need means we will have to find something cheaper and do that in another year. Again, I know this looks pretty bad right now but if things survived the winter after being transplanted last year it will be a very nice spot. 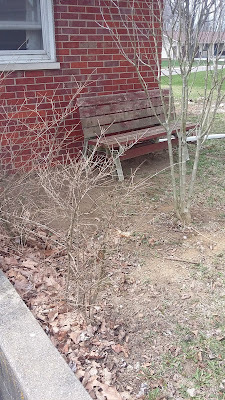 There's a couple of bushes that have always been there, the Rose of Sharon we moved, some hostas I put in the area, and I hope to put the hydrangea from the front here. I've been meaning to re-stain that bench for three years but since I actually have the stain already it will get done this year! The kids' climbing tree is nearby this spot and our garden is just around the corner. This little nook is shady and lovely when everything is green, the perfect spot to watch the kids play or take a rest after weeding the vegetable patch. 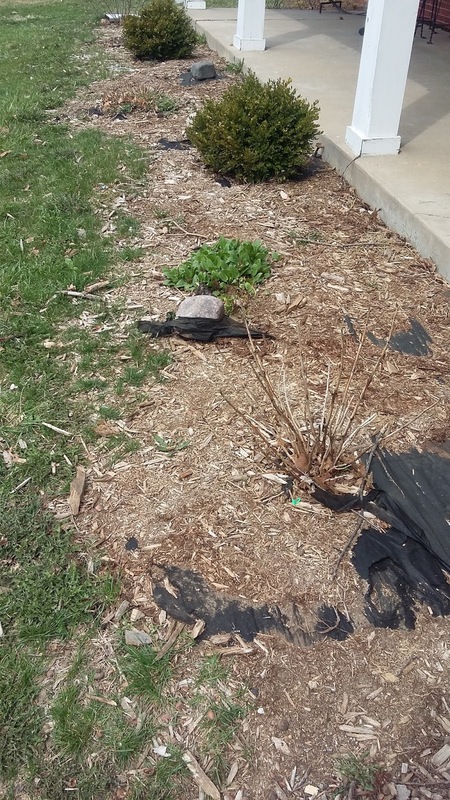 Our vegetable garden will have asparagus, peppers, tomatoes, onions, squash, and a couple herbs. Our boys want to grow corn and pumpkins and the girls want to have a strawberry patch. And that's it. Flowers will be all around the house. I'll dig in the dirt, grow food and flowers, make hourly trips outside to pick Japenese beetles off my precious plants and mutter, "Die you bastards," as I toss them into a bowl of soapy water so they can suffer and die without harming all the hummingbirds, bees, and butterflies I'm trying to attract. It's all so picturesque! I cannot wait. Can. Not. Wait. Yes! We also have had only one day (yesterday) and our last free yard-waste pickup is Monday. 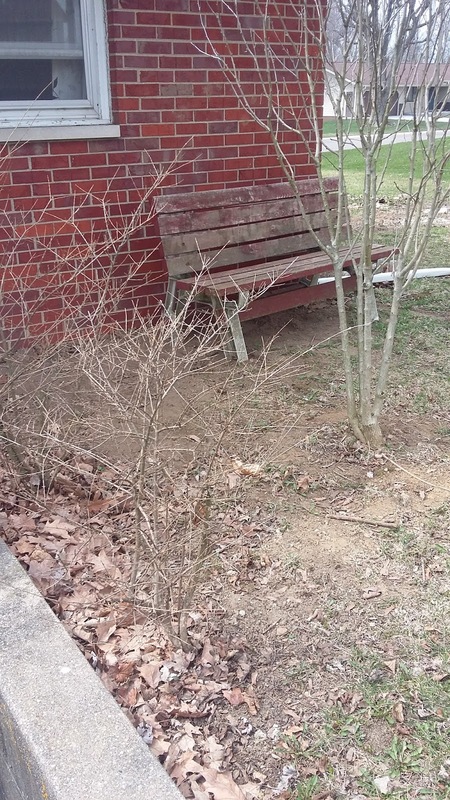 So I also cleaned out my flower beds! They also will look better when things start growing because they look rough right now! You have such great plans! I am the worst about knowing what to do to beautify my yard so I don't do anything. Well,a couple years ago I planted a bunch of tulip bulbs but very few of them came up. BOO! So, as someone else with more plans than money...I finally bought some cushions for benches around our fire pit at the end of summer at home depot. All their cushions were super cheap. I think the ones I got were like $5 a piece. I know you probably don't want to wait till the end of summer but if money doesn't present itself before then it's an option! 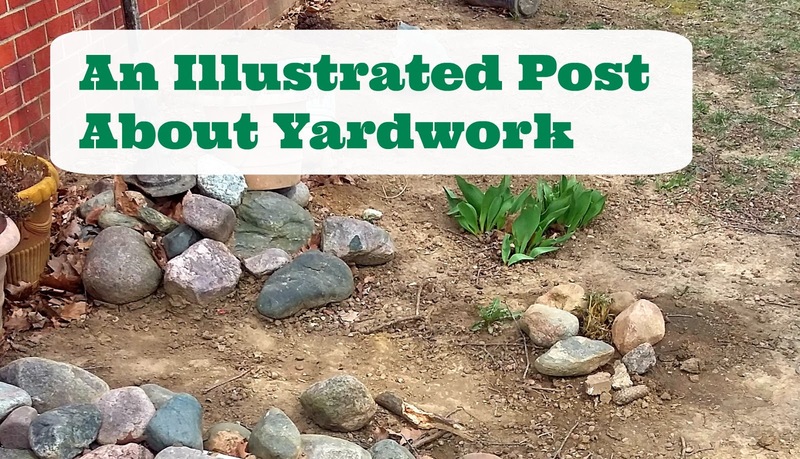 I toooootally feel you with "all the plans/crappy yard sitch but not in the budget!" It's rough! But like you, we try to do little things each spring/summer to at least make a dent. We borrow as many power tools as we can from my parents or neighbors (so things like power chain saw and such for trimming big tough bushes and branches). We did invest in a gas-powered weed-whacker finally last summer after almost 4 years of a constantly-breaking one! So I have ideas for you lol! Hope that is okay ;) you can often cut a transplant piece off of a bush / plant / tree and make a new one, so you could google or ask a nursery about the best way to do that and use that as a free way to get another butterfly bush and additional planting’s from friends who don’t mind sharing clippings. It will take longer to get to a larger size of course, but free! I love your plans and gardening! So exciting! I’m going to mostly live vicariously through others’ gardens this year since I’ll have a newborn and I’m not sure how long we are staying in the home we are renting so we don’t do anything major anyway. Maybe some begonias and a potted tomato plant :) we’ll see!